We're excited to announce a new feature on the DeployHQ platform today, a native Slack integration that allows you to set up and receive deployment notifications even more easily than before, as well as a bot, that you can use to trigger deployments! 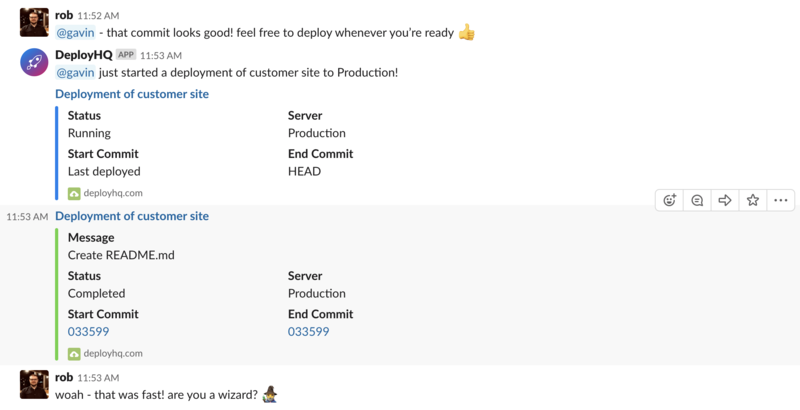 This means you can start a deployment from the comfort of your Slack app without having to login to the DeployHQ interface. There are some enhancements to the deployment notifications too when triggering a deployment from Slack, with a user mention added linking the deployment to the user that triggered it. For anyone already using the older Slack incoming webhook for notifications, they will continue to work as normal. However, you can migrate your projects out to the new integration at any time. You'll find more information about the new integration and how to set it up on our website.